TACLOBAN CITY – The Philippine National Police (PNP) and the Armed Forces of the Philippines (AFP) should be more cautious to avoid another incident of misencounter among themselves. Thus said Senator Paolo Benigno ‘Bam’ Aquino IV, reacting to the incident in Sta. Rita, Samar that resulted in the death of six policemen and wounded nine others on Monday (June 25). “Nangyari na po ang friendly encounter kahit nung sa Marawi and kailangan po talaga maging maingat po ang ating kapulisan at ang Armed Forces para masiguro na walang buhay na nawawala po dahil sa kasama rin natin sa gobyerno,” Aquino said. 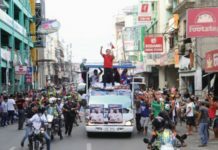 The senator was in the city as a guest during the holding of Pintados-Kasadyaan Festival of Festivals on Wednesday (June 27). “Kailangan maging maingat po talaga tayo sa mga engkwentro. Hindi po naging malinaw sa akin kung ano po ang nangyari yun. May nag-banggit po na baka wrong intelligence; may nag banggit kanina na hindi daw nakita. Right now, ang mahalaga po ay magbigay po tayo ng kalinga dun sa mga pamilya ng namatayan and hopefully very soon, kapag malinaw na po ang mga detalye, makita na po nating kung ano ang pwedeng gawin upang hindi na po ito maulit muli,” Aquino said. Following the incident, the 8th Infantry Division and the Police Regional Office 8 immediately conducted separate investigations. The incident in sitio Lunoy, Sta. Rita resulted in the death of six policemen- PO1 Wyndell Noromor, PO1 Edwin Ebrado, PO1 Phil Rey Mendigo, PO1 Julius Suarez, PO1 Rowell Reyes, and PO1 Julie Escalo. 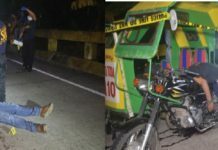 Wounded in the same incident were nine policemen- PO1 Elmer Pan, PO1 Cris Angelo Pialago, PO1 Romulo Cordero, PO1 Joenel Gonzaga, PO1 Rey Barbosa, PO1 Roden Goden, PO1 Jaime Galoy, PO1 Rommel Bagunas and PO1 Jomark Adones.